Skip the bus . . . Walk or bike instead! Ever thought about walking or biking to school? If you have ever thought about having your child walk or bike to school – now is the perfect time to give it a try! The 2014 National Walk/Bike to School Day is coming up on Wednesday October 8th and schools across our region are gearing up to have their students walking (and biking) to school on that day. Check to see if your school is participating and find out how you can join in on the fun! Wondering why kids should walk or bike to school? Beyond the fact that walking and biking to school just sounds like a lot more fun than riding the big yellow monstrosity that we commonly refer to as a school bus, there are lots of other reasons why we should promote kids walking and biking to school. Perhaps most importantly is the fact that an active trip to school, via walking or biking, provides a chance for both kids and adults to get the physical activity we all need. It’s also a greener way to get to and from school – by walking or biking you reduce car and bus trips, thus reducing congestion and air-polluting emissions! In the long run, encouraging walking and biking to school builds support for necessary infrastructure improvements and boosts a sense of community. How can I help my school put on a walk or bike to school day event? Think about the type of event that you want to organize. Will it be a walking event, a biking event, or both? Think about ways to engage all students and consider the community in which you are hosting your event. In some cases it may be more appropriate to celebrate this day by hosting a Walk/Bike AT school event instead of a Walk/Bike TO school event. Make sure your school principal supports your event before you go any further with your planning. It may be a good idea to talk to other relevant school members such as the PTA president, PE teacher, or school counselor. 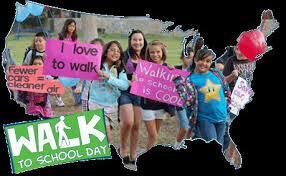 You can register your event on the National Walk/Bike to School website! It’s free to register and you will get access to materials such as templates for stickers, certificates, and badges! By registering your event you are highlighting what your school is doing to participate in the National Walk/Bike to School Day celebration! You will want to build a team of people to help you on the day of the event and to help with the planning of the event. Consider approaching school administrators, teachers, parents, local law enforcement, PTA, crossing guards, local businesses, health advocacy groups (such as Kids Run RVA! ), bicycle shop owners, bicycling advocates (don’t forget about the Bike/Walk RVA guys! ), and other school champions or community advocates. This is where you go from brainstorming and recruiting to taking action and delegating! By the end of this step you should be able to describe the event so that the families, school, and community know what to expect on the day of the event! It’s crucial to get the word out about this awesome event that you have planned. Consider promoting the event by making intercom announcements, including the event in the school newsletter or emails to parents, sending home fliers to parents, and sending out a press release to the local media. This is the day you have all been waiting for! Congratulate all walkers and bicyclists, be sure to thank volunteers and sponsors, record the number of participants, and take lots of photos! Oh yeah – don’t forget to HAVE FUN!!! You can streamline the planning of your next event by saving materials, keeping track of your contacts, and saving your photos and any press coverage. This is also an important time to send thank you notes or emails to all volunteers and partners. Most importantly – find a way to follow up with the student body, parents, and school faculty to encourage walking or biking to school more consistently! There are a ton of resources and a wealth of information on the National Walk/Bike to School website. You can even find the contact information of event organizers from several of our local schools. They may be able to give you some tips on how they made their event a success! Be sure to check out the Active RVA website after National Walk/Bike to School Day (remember – it’s October 8th). We will be highlighting a few of the events in our area!